Phil Plait's Bad Astronomy: Misconceptions: Will Galileo Make Jupiter a Star? Will Galileo Make Jupiter a Star? Update (November 14, 2003): It turns out that I made an error in one of my arguments on the original version of this page. It doesn't affect the end result (that Galileo cannot blow up like a bomb), but I want to make sure I am honest here. I don't want this to get in the way of the main point, so I am putting the explanation of my error at the bottom of this page. This page now reflects the current arguments. Here is the old, incorrect page. In October of 1989, NASA launched the Galileo spacecraft toward the planet Jupiter. Its mission was manyfold: to explore the moons of the giant planet, to investigate the environment of Jupiter's neighborhood, and to drop a probe into Jupiter's atmosphere to measure its physical characteristics. After nearly eight years, Galileo's mission is over. It is out of fuel, and has been hammered by Jupiter's radioactive magnetic field for so long that its hardware is dying. NASA decided that the best thing to do is use the remaining fuel to drop the spacecraft into Jupiter, where it will burn up harmlessly. They feel this is better than letting it continue to orbit the planet, because it might eventually crash into one of the moons. One such moon, Europa, may just possibly have the right conditions for life to evolve, and they don't want Galileo to contaminate the moon, even given the extremely long odds of it happening. Galileo will plunge into Jupiter on September 21, 2003, around 20:00 hours Greenwich time. But some people think that NASA had more plans for Galileo. They claim that NASA's nefarious scheme was to drop Galileo into Jupiter and use it to ignite Jupiter like a fusion bomb, either turning it into a star like the Sun, or simply blowing it to smithereens. J.C. Goliathan, one of the main proponents of this "Jupiter ignition" idea, has a long page about all this. Can this be true? Could NASA accomplish such a dastardly plot? As always, the short answer to this is to look at the title bar of your browser and read the name of this website. To save you time, I'll just say it here: no, Galileo will not do anything to Jupiter. Like a meteor, it'll burn up in the dense atmosphere, and become a part of the solar system's largest planet. Yet the idea that Jupiter may explode is spreading across the web, sticking in this case (unlike the Moon Hoax or Planet X) mostly to the woowoo sites. So what are the main ideas behind it, and why are they wrong? There are several ideas put forth, and they are wrong for lots of reasons. They sound legitimate, as many pseudoscientific ideas do, but that's different than actually being right. Let's take a look. Galileo has plutonium onboard. This is what makes fission bombs! NASA plans on creating a fission bomb using Galileo. Fusion bombs are made by using fission bombs as triggers. The implosion caused by a fission bomb ignites hydrogen into fusion, generating a much bigger blast. Jupiter is made of mostly hydrogen! So it can be blown up like an H-bomb. Stars work by fusing hydrogen. Jupiter might turn into a star, or it might simply blow up like a bomb. Got all that? OK, point-by-point, let's see why it's all wrong. 1) Galileo has plutonium onboard. This is what makes fission bombs! NASA plans on creating a fission bomb using Galileo. Galileo does indeed have plutonium (Pu) onboard. The instruments onboard need power, and Jupiter is too far from the Sun to use solar power very well. The solar panels would need to be very large, too large and heavy to get to Jupiter. Instead, Galileo uses a tried-and-true technology: radioisotope thermoelectric generators (RTGs). Basically, these are extremely simple devices: inside an RTG is a pellet of radioactive material. As the material decays, it generates heat. The heat is converted to electricity, which powers the spacecraft. Galileo's RTGs use plutonium in the form of ceramic pellets of plutonium dioxide. There is about 50 pounds of Pu onboard, stored in 144 separate cylindrical pellets. There are two RTGs on Galileo, each with 72 pellets (a paper about RTGs with a diagram can be found at NASA's Space Science website). Note: I am not going to get into a discussion over whether RTGs are safe, and the dangers or lack thereof posed by launching radioactive materials into space. Please read Spaceviews' page on RTGs for more info, and their list of pro and anti RTG sites as well. Fission bombs work in this (simplified) way. The nucleus of a plutonium atom naturally splits into two or more pieces when a neutron (a subatomic particle) hits it. When it splits (also called fissioning), it releases energy and more neutrons. These hit other nuclei, causing them to split, etc. If the atoms are too far apart, then this effect won't work, because, basically, the neutrons miss the other nuclei. But if the atoms are packed tightly enough, you get a runaway reaction. More and more split, the energy released gets very big, and boom! Atomic bomb. The amount of mass you need packed together to get a runaway chain reaction is called the critical mass. For plutonium 238, the kind that was on Galileo, you need about 10 or so kilograms (22 pounds) all packed tightly into a ball. Galileo had more than that amount on board, but (and this is a huge but) it was spread out in smaller pieces. The RTGs extend along a long boom, a rod that extends out from the main body of the spacecraft, and not in a way that works as a fission bomb. There are 72 separate chambers where the Pu238 was stored, and each piece had a sub-critical mass. You would have to compress those pieces together to make them critical and cause a fission reaction. But that could not happen. Why not? Because Galileo entered Jupiter at a speed of about 100,000 miles per hour. At that speed, the pressure would tear the spacecraft apart. It slows as it passes through denser atmosphere, of course, but the pressures would be so high at those velocities that Galileo would be shredded. As the pieces fall off, they are heated due to compressing the air in front of them. This is why meteors get hot, in fact, and at these speeds the metal on Galileo would melt in short order. This would release the plutonium, dispersing it. So instead of compressing it, as the pseudoscientists claim, the plutonium would actually get strewn through Jupiter, making it literally impossible to explode. So step one -- Galileo becoming a fission bomb -- cannot happen. Not that this stops the pseudoscientists, of course. The doomcriers at YOWUSA make a big deal of how Pu is used in a bomb, and even show the geometry of a fission-induced fusion bomb (Note added November, 2003: YOWUSA has made their archives available only to subscribers, so the image is no longer available). But that's not how the RTGs are constructed! Posting that image is grossly misleading. The RTGs are not in anything like the geometry of a fission bomb. This is more obfuscation on the part of the doomsayers. Also, the YOWUSA folks, when quoting Goliathan, appear to think that somehow the pressure from the passage of Galileo through Jupiter's atmosphere will compress the plutonium enough to start a chain reaction, which will then trigger fusion. But the fission has to happen with precise timing, and in a certain geometry. How do they propose that will happen, exactly, with Galileo tumbling down into Jupiter, parts of it flying off due to the heat and pressure of supersonic atmospheric entry? They somehow conveniently left that part off of their description. Conclusion: The plutonium on Galileo cannot fission to become a bomb. 2) Fusion bombs are made by using fission bombs as triggers. The implosion caused by a fission bomb ignites hydrogen into fusion, generating a much bigger blast. A hydrogen bomb explodes because atomic nuclei of hydrogen are squeezed together. If squeezed hard enough, the atomic nuclei fuse (stick together), and that releases energy. You have to apply a lot of pressure and heat to get the hydrogen to do this, and one way to do that is to use the blast wave from a fission bomb. Basically, a fission bomb is used to trigger a process which creates the hydrogen fuel for the fusion reaction (more on this in a moment). The shock wave and heat from the fission explosion must work in a very specific way to do this. When it works, the fusion releases far more energy than a fission explosion, which is why H-bombs have so much more explosive yield than A-bombs. And hey, isn't Jupiter mostly hydrogen? Yikes, a fission explosion can make Jupiter explode like a bomb! No, it can't, and for two reasons. Well, three if you include the fact that Galileo couldn't make a fission bomb, as noted above. But even if it could, it wouldn't make Jupiter detonate, because the RTGs aren't configured to be used as a fission trigger, and because Jupiter doesn't have the right stuff in it to fuse. While Jupiter is mostly hydrogen, it's the wrong kind. Remember isotopes; atoms with different number of neutrons? Hydrogen has them too. A hydrogen nucleus at its simplest is just a lone proton. Deuterium (D2) is hydrogen with a neutron and a proton, and tritium (T3) is a proton with two neutrons. Fusion bombs need the neutron-added isotopes. Regular old hydrogen won't do it. Simply taking a sample of hydrogen gas and compressing it won't make it fuse; you need a fuel enriched with D2 and T3. Finding these materials isn't all that easy, and a randomly selected pocket of Jupiter's gas is unlikely in the extreme to have them in sufficient quantities to explode. What's worse, the way we make bombs these days, you need lithium to make them work, and that's not terribly common in Jupiter either. Here's how a fusion bomb works. You need a fission explosion to start with, which is used to do two things: it generates X-rays, which heat and compress the fusion fuel, and it actually helps create the fuel. As I have discovered while researching this article, the process is somewhat complicated. In a very brief nutshell, the fission explosion is used to irradiate lithium. Neutrons from the fission explosion combine with the lithium to create tritium. The heat and pressure from the X-rays compress the tritium, and bang! Again, this sequence of events is highly unlikely to occur on Jupiter. You need lots of lithium, which is not terribly abundant. You need it to make tritium, which is highly unstable (it doesn't last long once created) and again unlikely in the extreme to be found in Jupiter's atmosphere. It's really just plain old silly to think this could happen with Galileo, even if it had the right kind of fission material. Which it doesn't. However, conventional belief says that Deuterium and Tritium (isotopes of Hydrogen) are necessary to accomplish fusion. Both may be present or created during a reaction within the dense liquid hydrogen of Jupiter. Again, he doesn't state how this might happen. I am not an expert on such things, and won't speculate, but it seems unlikely that Jupiter can create these elements, given that it takes nuclear reactions to do it (specifically, a proton has to absorb an electron and an anti-neutrino to become a neutron). Jupiter isn't big enough to do it. Even if you supplied a fission bomb, you won't get hydrogen (tritium) to fuse. And Galileo doesn't have what it takes to make a fission explosion. 3) Stars work by fusing hydrogen. Jupiter might turn into a star, or it might simply blow up like a bomb. OK, so we don't have fission, and we don't have fusion. So let's suppose, contrary to all evidence, that NASA is really lying to us, and has put fission bombs and fusion fuel aboard Galileo. When they go off, will Jupiter explode, or turn into a star? Nope, and nope. Fusion is not a runaway process. Once you start it up, it generates a lot of heat, which tends to expand the material violently (this is what we technically call a bomb). This means the fuel gets scattered, and it won't fuse. Making really big hydrogen bombs run into this problem, making it hard to make really big bombs, which in my book is perhaps a good thing. So the process tends to damp itself off. Jupiter won't explode. It won't turn into a star, either. Stars work by maintaining fusion in their cores. Now, I just said fusion isn't self-sustaining, so how do stars keep it going? They do it by containing the hydrogen in a small volume. This is accomplished by piling a lot of mass on top of the hydrogen: the mass of the star. The star has enough gravity that all that mass squeezes and heats the core enough for fusion to not only take place, but to continue at a relatively stable pace. But it turns out there is a lower limit to that mass; if you don't have enough, then you don't get the high temperatures and pressures necessary to ignite fusion. That mass is about 0.077 times the mass of the Sun, or 80 times Jupiter's mass. In other words, Jupiter is 1/80th the mass it needs to turn into a star. Some people call Jupiter a failed star, but in reality it ain't even close. Conclusion: Jupiter won't explode, or turn into a star, because it lacks the containment to keep fusion going. Some argue that the craft is caught in Jupiter's pull now, but with all of the gravity assist tricks available, and still some propellant left, the craft should be able to break free even if they had to use an assist of one of the larger moons. Here he shows a profound ignorance of the situation. Jupiter's gravity is immense. Escape velocity is quite high, nearly 6 times (*) that of Earth's! If Galileo had enough fuel to escape from Jupiter, then we wouldn't have needed to use gravity assists from Venus and twice with Earth. As an example, the propellant used to get to Jupiter needed to change Galileo's velocity by about 15 kilometers/second (the difference between the Earth's orbital speed and Jupiter's). The rocket could not provide that on its own, so we needed help from the gravity of Venus and Earth. But, to escape Jupiter from, say, the distance of Europa, Galileo needs to add 6 km/s to its velocity, a healthy chunk of what it needed to get to Jupiter in the first place. Closer in to Jupiter the situation is even worse. Up until about 2001, there was enough fuel on board Galileo to have it get into an escape trajectory, but after that there was too little fuel left. If I have time I will add to this article over the next few days, but I think I've made it pretty clear that this idea that Galileo will somehow cause a nuclear explosion on Jupiter is wrong. Remember, if you hear something on the web about how some astronomical event may cause doomsday here on Earth, read it with a very skeptical eye. 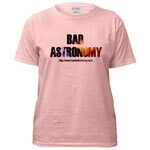 And check Bad Astronomy before you start putting your affairs in order! J.C. Goliathan's (grossly incorrect) original article. Facts about Galileo's RTGs, specifically. The physics of nuclear weapons. More on how bombs work. Why planets like Jupiter don't shine. Join a discussion about this at the Bad Astronomy Bulletin Board! Oops! I originally had the number 17 here, because I scaled the escape velocity of Jupiter to the mass ratio of Jupiter and Earth, and forgot to include the difference in radius of the two. The number 6 represents the correct ratio. Here is the explanation of the error I made in the original version of this page. This page which gives the critical masses for Pu238. Still, using Pu238 to make a bomb is difficult. It has a very high radioactivity rate, so it is dangerous to use when near critical mass (roughly 10 kilograms). Also, as I state in the page above, the RTGs onboard Galileo had nowhere near the critical mass in any one place, and when the spacecraft burned up, the plutonium would have been dispersed, not compressed. So I stand by my original conclusion: Galileo could not have detonated, and could not ignite nuclear fusion in Jupiter.